Just as digital cameras have changed the way we take photographs, so digital photo frames have changed the way we display them. With a digital camera, it’s easy to take hundreds of snaps without the fear of wasting expensive film, but there are downsides. For one, few of us have the space needed to display all these images and, for another, printing costs can be prohibitive. The answer may be a digital photo frame, a great way of showcasing all your digital photographs. Just one such frame can allow an avid snapper to display hundreds or even thousands of images and, even though this is still a relatively new technology, the cost of digital photo frames has fallen fast. Prices can vary greatly according to size, features and manufacturer, but by December 2009 budget digital photo frames had dropped to under £20. There is an additional small running cost, as digital photo frames need battery or mains power to operate, but this pales into insignificance when compared to printing costs. Some digital photo frames will play MP3s and videos, but ultimately it’s how good the photographs look that’s important. The screen resolution – i.e. number of pixels – will determine how fine or blocky the photograph looks and so is a key consideration. The more pixels the better. Also check the contrast ratios, typically displayed as two figures separated by a colon – like 300:1 or 500:1. In general terms, the larger the first number the better the contrast quality. Finally, look at the brightness rating. Of course, the size of the display is important, as is the look of the frame. Some offer changeable fascias, otherwise find one that suits, as wooden, leather, metallic, plastic and even mirror fascias are available. 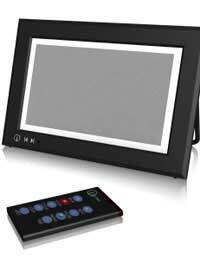 Top of the range digital photo frames can offer a dazzling array of features. Some frames have Bluetooth to allow photographs to be sent wirelessly from a mobile phone, some boast Wi-Fi and even an Internet Protocol (IP) address so that photographs can be emailed to them, some have a large internal memory to boost the number of photographs that can be stored and some feature card readers that accept many different formats. The next generation of digital photo frames are set to utilise Near Field Communication (NFC), which allows the transfer of photographs simply by touch. Gadgets with NFC technology can synchronise wirelessly with one another, much like Oyster cards on the London Tube. Of course, the photo device – be it a digital camera or mobile phone – must also boast NFC technology, so this set-up will come at a price. Once happy with the size and picture quality of the digital photo frame, consider what additional features could be useful. Most offer a wide variety of slideshow settings to display the photographs, but some will boast a remote control, alarm clock, calendar, MP3 or video player and speakers. There are even digital photo frames with built-in printers for those who want the best of both worlds. Sales of digital photo frames suggest the technology is here to stay and, when printing costs are taken into account, digital displays are becoming the most cost-effective way to showcase images. However, the quality of such frames can still vary greatly, so as always it is pays to shop around and get the most out of your budget.